The human heart is an organ found in the middle of the thorax. It is made from a specialised type of muscle called cardiac muscle and acts as a pump to push blood around the two circulatory systems. In fact it is better to think of the heart as two separate pumps, one for the pulmonary circulatory system to the lungs and one for the systemic system that supplies blood to all the other body organs. The diagram above shows in a simplified way this double circulatory system. The lungs are supplied with deoxygenated blood direct from the heart in the pulmonary artery but when the blood has passed through the capillaries in the lungs, it travels back to the heart in the pulmonary vein before being pumped in the systemic system around the body. Although cardiac muscle looks similar to the muscle that attaches to bones and moves the skeleton, it differs functionally in one important way. Cardiac muscle is myogenic: this means that the muscle fibres will contract without the need for a nerve impulse from the brain to initiate the contraction. Incidentally this is why a heart transplant is a possible surgical procedure. A transplanted heart will beat happily in the new body even though all the nerves going to the heart will have been cut in the surgery. You cannot have a biceps transplant at the moment because the transplanted biceps muscle would not do anything in the new patient. For the transplanted biceps to contract, the millions of individual neurones going to it would need linking up individually and this is not possible. This is a simplified diagram showing the structure of the heart. You can see that the left and right sides of the heart are completely separate from each other. This is essential because the right side of the heart contains deoxygenated blood and the left side oxygenated blood. There are four chambers in the heart: two small atria at the top, and two larger ventricles at the bottom. The atria collect blood from the veins, the ventricles pump blood out of the heart into arteries. There are four sets of valves in the heart: the easiest way to remember where they are is to think that blood has to pass through a set of valves as it leaves each chamber. Valves allow blood to flow through them in one direction only. 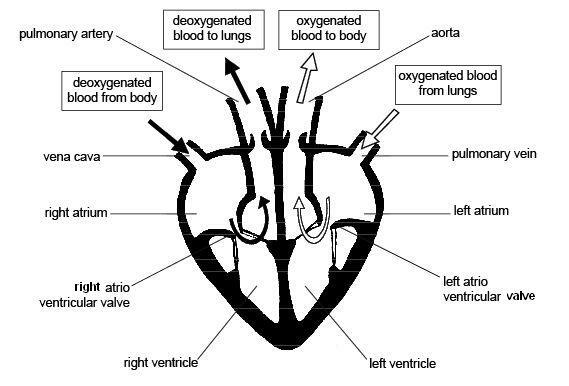 The AV valves stop blood going back from the ventricle into the atrium when the ventricle contracts, the aortic and pulmonary valves (not labelled on the diagram above for some reason….) prevent blood falling back into the ventricles in between heart beats. You also need to know the four main blood vessels that are attached to the heart. The vena cava is the largest vein in the body and carries deoxygenated blood from the organs of the body into the right atrium. The pulmonary artery comes out of the right ventricle and pumps this deoxygenated blood to the lungs. Oxygenated blood returns from the lungs to the left atrium in the pulmonary veins, passes into the left ventricle and is then pumped out of the heart in the aorta, the biggest artery in the body. I’ve just spent 45 minutes trying to find a good video on heart structure to put into the post but without success…. If anyone knows a really good YouTube clip (must be under 5 minutes) please add a link as a comment at the foot of this post. 1. Diastole. During this stage the cardiac muscle is relaxed (the heart is between beats) and blood can enter the atria and then fall into the ventricles through the open AV valves. 2. Atrial Systole. This stage in when the cardiac muscle in the atria contract, increasing the atrial pressure and pushing blood down into the ventricles. There is a small region in the wall of the right atrium called the sino-atrial node (or pacemaker) which initiates each heart beat. 3. Ventricular Systole. After a short delay, the cardiac muscle in the ventricles contracts. This increases the blood pressure in the ventricle which in turn causes the AV valve to close, and the aortic or pulmonary semilunar valves to open. As these valves at the exit of the ventricle open, blood gets pushed into the arteries and out of the heart. Look at the diagram above and make sure you understand the meaning of these three terms. The diagram below is much more complex and perhaps you should not worry too much about it….. The important bit is to understand when the valves in the heart open and when they close. It is quite simple really although you would be amazed how confused people can get…. The opening and closing of a valve is not “controlled” in any meaningful way in the heart. The valve has a structure that will only allow it to open in one direction. Let’s consider the AV valves. These can open to allow blood to pass from the atria into the ventricles during atrial systole but will close during ventricular systole to stop the blood flowing back where it came from. 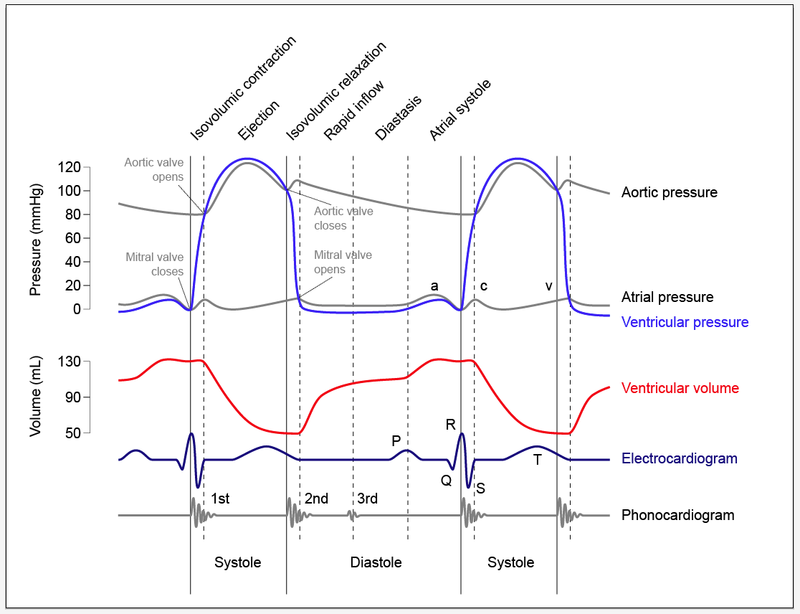 The AV valve will be open whenever the blood pressure in the atria is greater than in the ventricle. 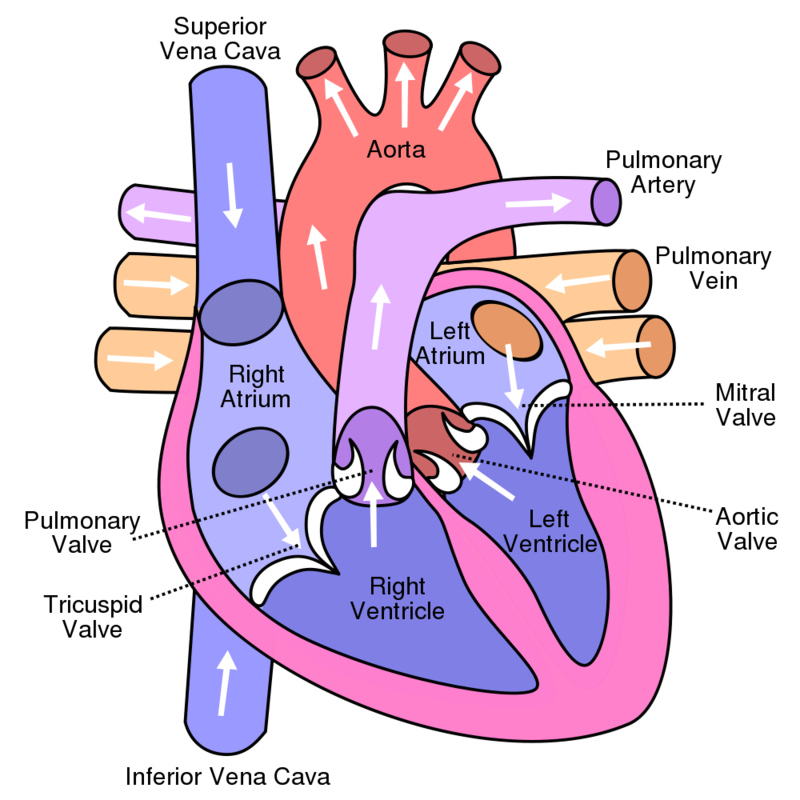 The AV valve will be closed whenever the blood pressure in the ventricle is greater than in the atrium. Look at the graph of pressure changes below. You can see the mitral valve (I hate that name) is closed as soon as the ventricular pressure exceeds the atrial pressure and it opens again during ventricular diastole as the pressure in the ventricle drops. 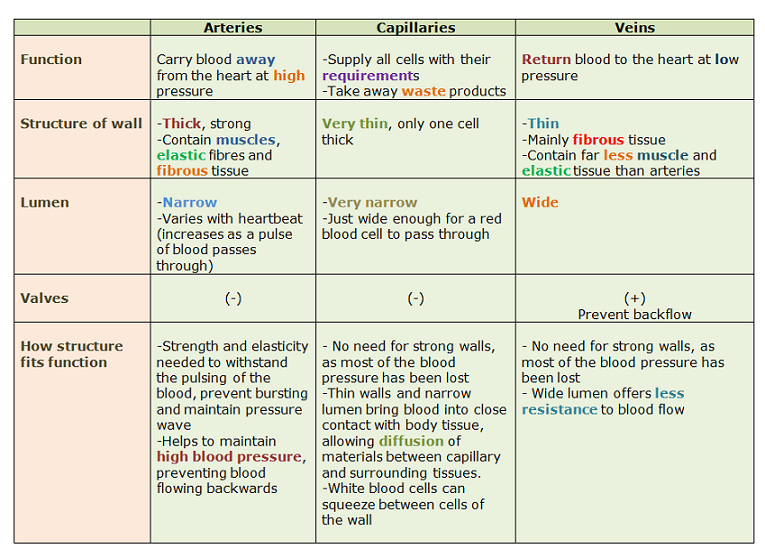 In this post, I will look at the structure and function of the three main types of blood vessel in the human circulatory system. Although this is not the most difficult topic, there are a few things that can catch out even A* GCSE students in the heat of an exam. Arteries are the blood vessels that take blood away from the heart. Because the blood is coming straight from the ventricles of the heart, it will be at a high blood pressure and will flow in pulses. This means that arteries need a thick wall to withstand this high blood pressure. All arteries apart from one carry oxygenated blood. Can you remember which artery is the exception to this rule? The artery wall has a narrow lumen (the space where the blood flows) as this helps to maintain the high blood pressure within. 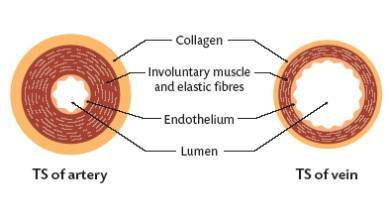 There are also many elastic fibres in the middle tissue (tunica media) of the artery wall. This elastic tissue is important because the blood flows in pulses. The artery wall needs to stretch as the pulse of blood passes and the elastic recoil of the wall helps to push the blood along in between heart beats. The tunica media also contains a lot of smooth muscle. Why do arteries need muscle in their walls? When this muscle contracts it narrows the lumen of the vessel. This will increase the blood pressure and so one reason for muscle in arteries is to regulate the blood pressure. But there is something more… Arteries carry blood into the organs of the body and the pattern of blood flow to different organs can vary depending on the conditions. For example, when you are running, you need more blood to go to your skeletal muscles (to carry oxygen for respiration and to remove heat and carbon dioxide) and less to go to the digestive system. This is brought about by the smooth muscle in the artery taking blood to the intestines and stomach contracting so that less blood can flow through the vessel. The smooth muscle in the arteries in the exercising muscles will relax so that more blood can pass. This shift in the pattern of blood flow is the second key significance of arteries having lots of muscle in the walls. Veins have the same tissues in their walls as arteries but they are much thinner. The blood is flowing at a much lower pressure in veins as all the pressure from the heart has been lost in the extensive capillary beds in the tissues. Veins return blood to the heart and all bar one (the pulmonary vein) contain deoxygenated blood. As there is low blood pressure in veins, this can cause problems moving blood back to the heart especially when against gravity. Veins contain valves which only allow blood through in one direction thus preventing the blood falling back. The thin walls of veins also mean that they can be compressed by the action of skeletal muscles. When the muscles that move the skeleton contract, they can squeeze on veins and help to return blood to the heart. 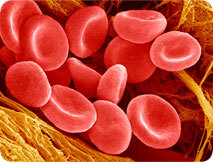 Capillaries are the smallest of the three types of blood vessel. They are found in the tissues throughout the body and are beautifully adapted to ensure the exchange of materials between the cells of the body and the blood. The lumen of a capillary is less than the width of a red blood cell and so red blood cells pass through capillaries in single file and only be squeezing along. This ensures the speed of blood flow in capillaries is very very slow. 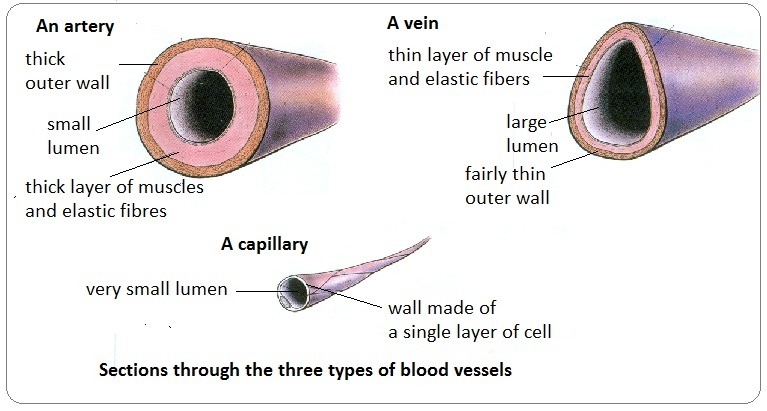 The lining of a capillary is made up of a single layer of cells called the endothelium. Arteries and Veins have an endothelium too but in the capillary the endothelial cells have gaps between them called pores. 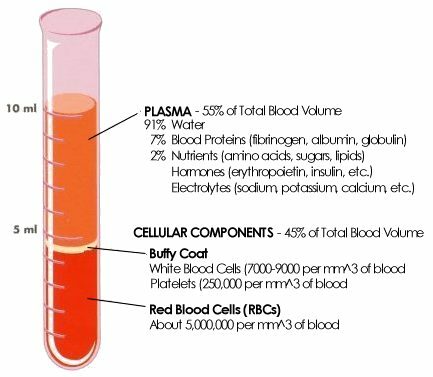 This allows the fluid component of blood and various white blood cells to leak out of capillaries to form tissue fluid. This leaky nature of capillaries is very important as it provides the fluid that bathes the tissues of the body. Breathing is the movement of air in and out of the lungs. It is a small point but you must be careful with your language in answering questions in this topic. Meaning is lost if words are not used correctly: for example often candidates write than “oxygen is breathed in and carbon dioxide breathed out….” Can you see why this is not correct and actually muddles your understanding of the process? So back to breathing – the movement of air in and out of the lungs…..
1) What is the pathway air follows to get from the atmosphere and into the alveoli in the lung? The trachea is the main tube that carries air into the lungs. It has a ciliated epithelium lining – these cilia waft mucus and foreign particles up to the top of the trachea and then the mucus is swallowed into the stomach and any bacteria trapped in the mucus are killed. The trachea is also strengthened by C-shaped rings of cartilage that prevent the tube collapsing when the air pressure inside drops. The trachea branches into two tubes called bronchi, one going to each lung. 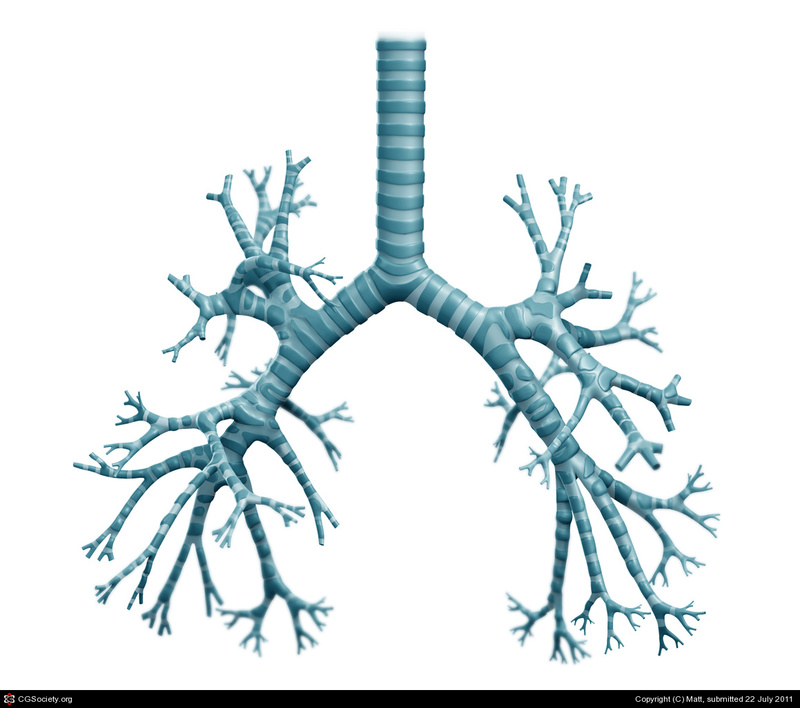 The bronchi branch over and over again into smaller tubes called bronchioles and ultimately the smallest bronchioles end in a cluster of microscopic air sacs called alveoli. This whole structure is called the Bronchial Tree. 2) What causes air to move in and out of the lungs in breathing? The movement of air into and out of the lungs is brought about by the action of two muscles: the diaphragm, a dome-shaped muscle that separates the thorax from the abdomen, and the two sets of intercostal muscles. This is an easy area to get confused as there are plenty of similar words and precision in explanation is vital to clear understanding….. Breathing in (Inhalation) is the active stage in breathing. 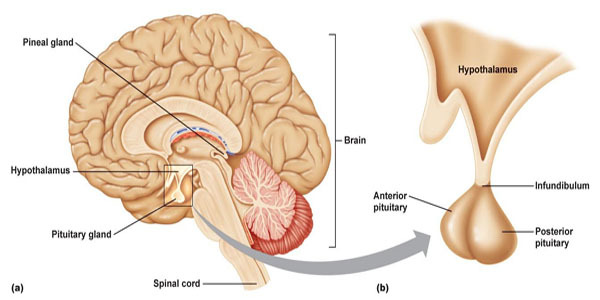 This means that under normal condition it is the stage in which the muscles contract. During inhalation, the diaphragm contracts. This contraction causes it to change shape from the dome-shape at rest to a flattened shape. This change in shape of the diaphragm increases the volume of the thorax (in fact it is the volume of the pleural space between the two pleural membranes that is significant but we might skip over this for simplicity….). If the volume of a gas increases, the pressure decreases (Boyle’s Law I seem to remember from boring Physics lessons a long time ago). If the pressure in the thorax decreases, it may drop below atmospheric pressure and so air can be pushed into the alveoli through the bronchial tree by the higher atmospheric pressure. Breathing out (Exhalation) is a passive process. The diaphragm is a most unusual muscle as it is very elastic. This means that when it relaxes, it springs back to its original dome-shape through elastic recoil. 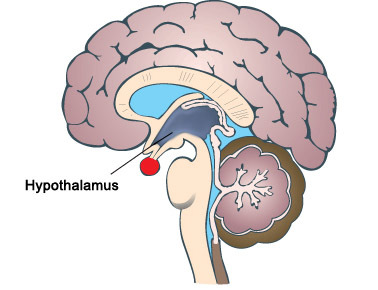 This movement decreases the volume of the thorox, thus increasing the pressure and if the pressure rises above atmospheric pressure, air will be pushed out of the alveoli. 3) What role do the Intercostal muscles play in breathing? 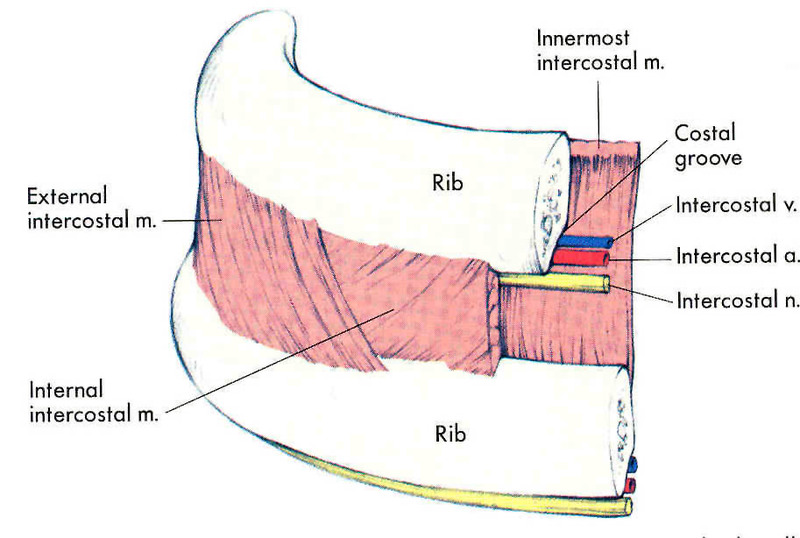 The intercostal muscles are two sets of muscles that are found between the ribs. Contraction of these muscles can either pull the rib cage up and out, or push the rib cage down and in. The muscles on the outside are called the external intercostal muscles and the ones on the inside are called internal intercostal muscles. When you are breathing at rest the rib cage does not move at all. (I hope everyone reading this post is calm, relaxed and not hyperventilating in panic over upcoming exams….) As you are breathing at rest the only muscle involved is the diaphragm (see section above) as you are only moving about half a litre of air in and out with each breath. But there are situations in which this tidal volume has to increase and that is when the intercostal muscles come into their own. The two sets of intercostal muscles are antagonistic – when one contracts the other relaxes. If you need to take a big breath in, the external intercostals will contract at the same time as the diaphragm. The external intercostals pull the ribcage up and out, thus increasing even further the volume of the thorax, thus dropping the air pressure even more in the thorax, allowing more air to come in. When you come to breathe out, the external intercostal muscles will relax and gravity will allow the ribcage to fall back down to its original position. Why is it that the first time your body encounters measles virus, you suffer from the disease measles? Why will someone who has had measles as a baby (or been immunised against it) never contract the disease measles even though the virus might get into their body many subsequent times? I thought in this post I should attempt to expand a little so as to provide answers to these two important questions. This understanding is quite complex for IGCSE but you cannot really see how immunity works unless you can work through each stage in the process. Let’s pretend you are a new born baby and you get measles virus particles into your bloodstream from contact with an infected person. Remember viruses are not living organisms as they are not made of cells and have no metabolism. All they are is a tiny particle made of DNA (genetic material) surrounded by a protein coat. 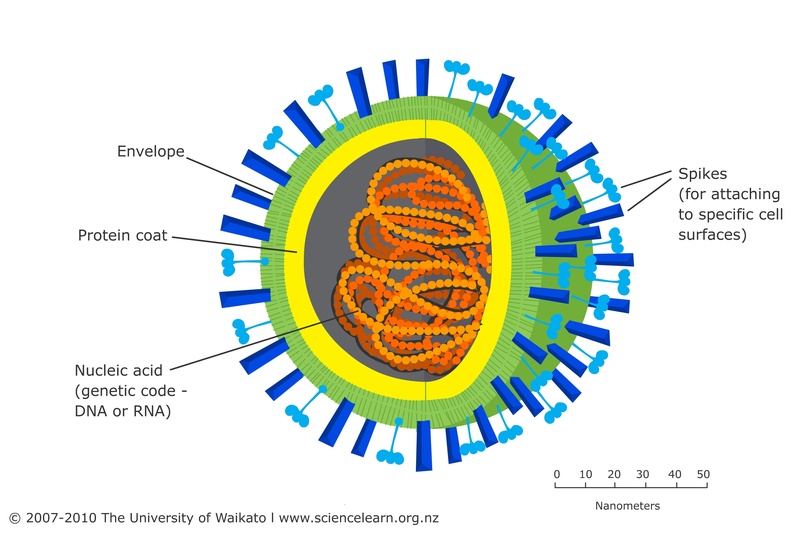 The “spikes” on the surface of the virus particle are proteins that are essential to allow the virus to get inside a host cell. But they can also act as antigens allowing the immune system to recognise the virus as a foreign object and so mount an immune response to it. Now here is the first key piece of information needed in understanding immunity. 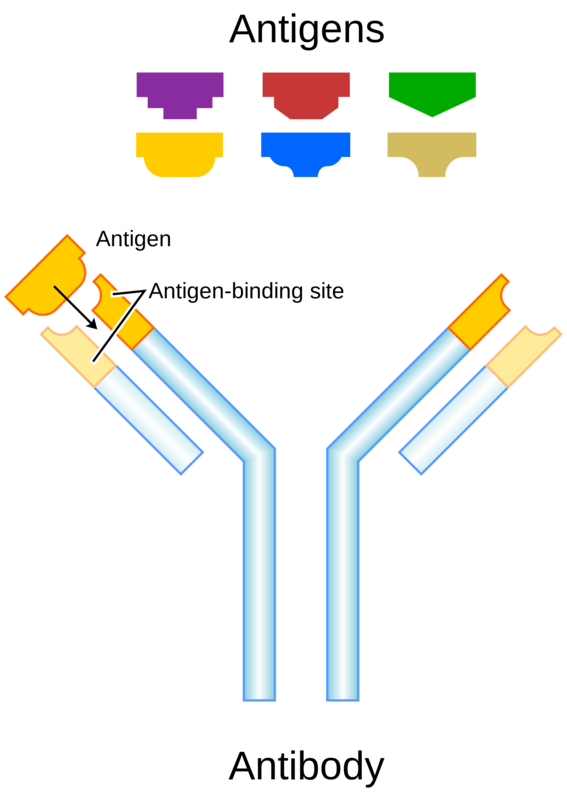 Each B lymphocyte is only able to produce an antibody molecule with one particular shape. So the reason you need hundreds of billions of lymphocytes is to be able to produce antibodies that have the correct shape to combat hundreds of billions of possible shaped antigens on a lifetime of pathogen exposure. Go back to your newborn baby exposed to measles virus. There might be only a handful of B lymphocytes in the babies’ body that just happen to be able to produce a shape of antibody specific to antigens on the surface of the measles virus. Before any antibodies can be produced, the “correct” B lymphocyte has to come into contact with measles virus particles and be activated. It then has to divide many times by mitosis to form a clone of plasma cells and the plasma cells have to differentiate and start producing antibodies. This whole process is called the primary response (first exposure hence primary) and it may take up to 8 days before any antibodies start appearing in the babies’ blood. What are the measles virus particles doing all this while? Well they are infecting host cells, damaging them and causing disease. This is why the baby will suffer from the disease measles. 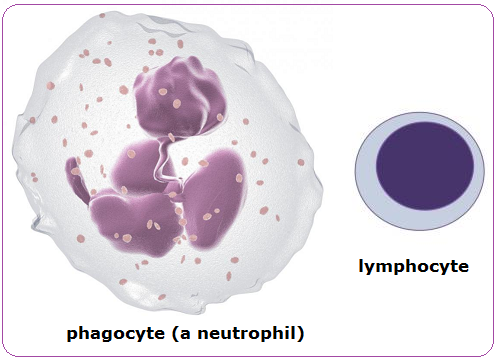 The second key piece of information for immunity is this: when the B lymphocyte that has been activated divides by mitosis to form a clone, not all the cells produced form antibody-producing plasma cells. 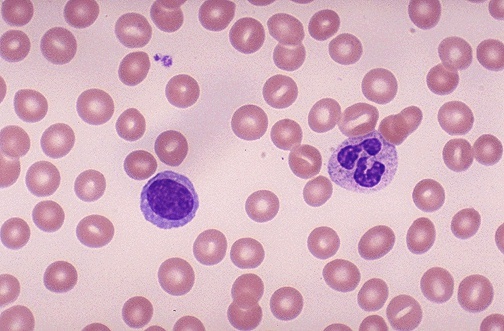 About 25% of the clone just remain as lymphocytes and are called memory cells. This is because they are long-lived cells that account for immunological memory. Let’s pretend the baby gets better from measles due to the antibodies produced in the primary response. What happens if years later, the child goes to school and meets measles virus again for a second time? You all know that the child won’t get the disease measles this time. This is because the immune response is different second time round – the secondary response. The secondary response to antigen is quicker (no 8 day delay), larger (more antibodies made) and lasts for longer. This is because in a secondary response there are not just a handful of B lymphocytes in the body capable of making antibodies to combat measles virus. There are now millions of memory cells left over from the primary response that can all immediately “leap into life” and start making antibodies. These antibodies will be produced so quickly and in such large numbers that the virus particles will be eliminated before they have time to cause harm and disease. No harm caused to host cells therefore no disease measles this time round! When answering questions on this topic in exams, candidates often think that it is the antibodies produced in the primary response that are left over to stop you getting measles later in life. 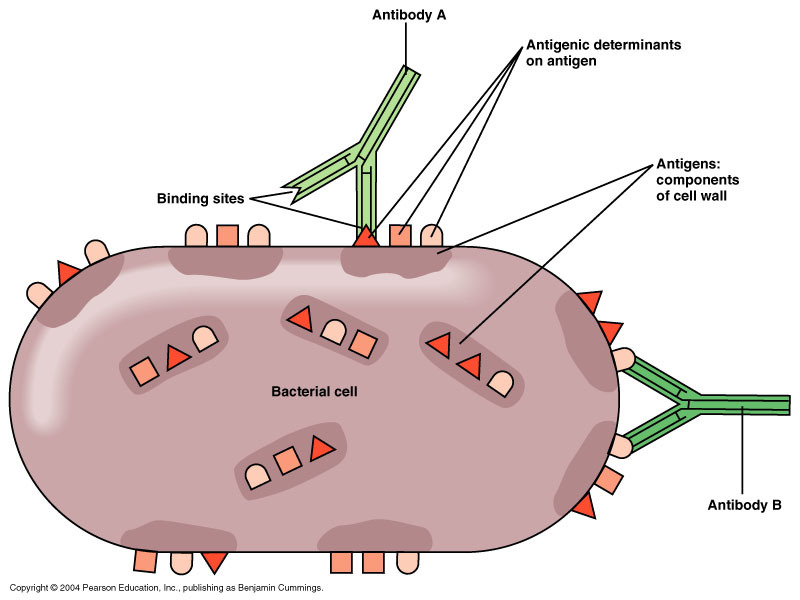 Look at a graph showing primary and secondary responses to antigen such as the one below. 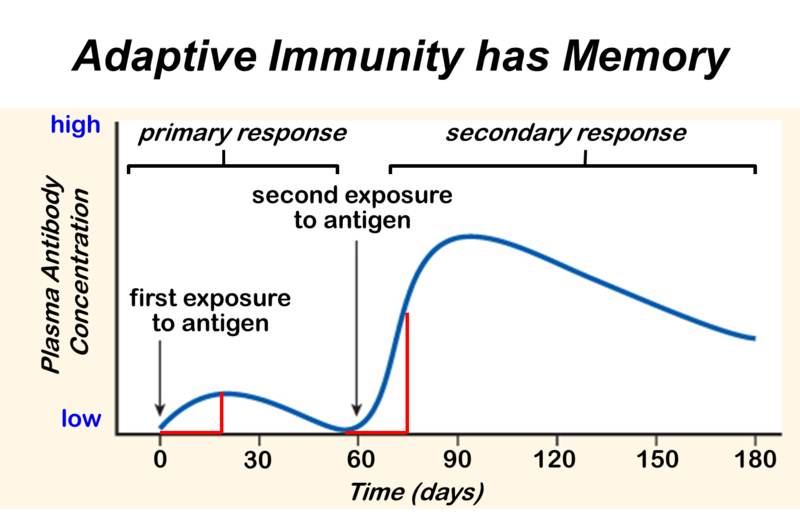 This graph shows how antibody concentration in the blood changes in the primary and secondary immune response. Antibodies are proteins and you can see they have a half-life in the blood of a few weeks. (The liver breaks down proteins in the blood as one of its many functions) So all the antibodies from a primary response will have been removed within a few months of the first exposure. Immunity can last a lifetime and this is because memory cells can survive as long as you do. Unlike antibodies they can hang around in your blood and lymph nodes for the rest of your life. If you live to be a hundred, you still won’t catch measles more than once. The two sections that are perhaps hardest to interpret are the ones on vaccination and the general plan of the circulation. At the end of the process, you should be able to provide a clear concise answer to the following question? 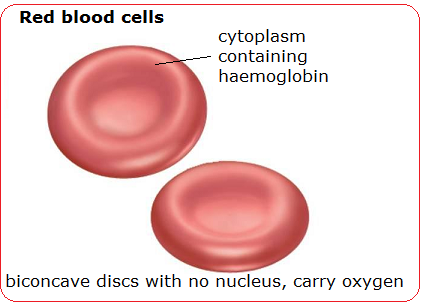 2) The blood vessels involved in the four organs mentioned are described below. Heart – receives blood from the coronary arteries which branch off the aorta before it has even left the heart: Why doesn’t the cardiac muscle in the heart just get the oxygen and nutrients it needs from the blood in the chambers? Lungs – pulmonary artery takes blood from right ventricle to the lungs, pulmonary vein return oxygenated blood to the heart and empty it into the left atrium. What is unique about the composition of the blood in the pulmonary artery? Liver – has a most unusual blood supply. There is a hepatic artery that branches off the aorta and brings oxygenated blood to the liver. Blood also goes to the liver in the hepatic portal vein which brings blood from the small intestine. Blood in the hepatic portal vein will contain lots of dissolved glucose and amino acids, both of which are processed in the liver. Deoxygenated blood leaves the liver in the hepatic vein. Find a diagram to show the arrangement of these three blood vessels. 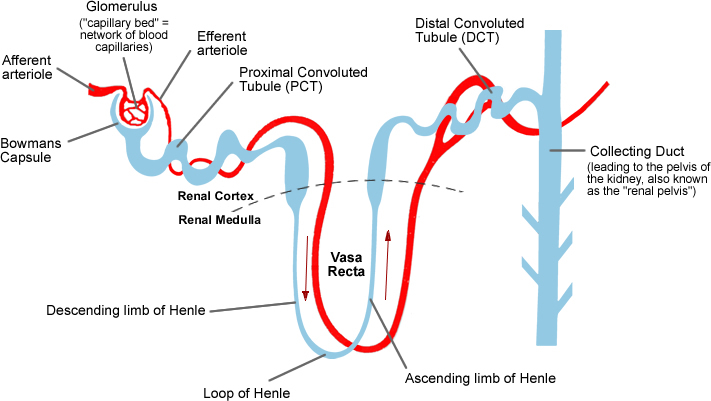 Kidney – straightforward blood supply in that there is a renal artery and a renal vein. 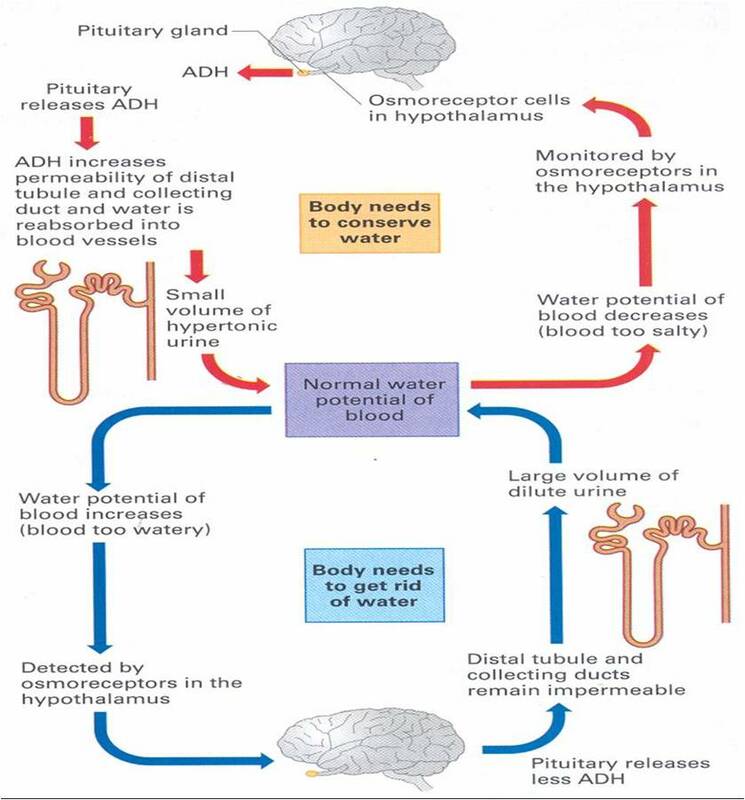 (important idea is that the renal artery is much much bigger than you would expect from the size of the organs: 25% of the cardiac output of blood flows through the kidneys on each circuit) Why do you think this is? I hope this helps – more to follow when I get home from my holidays tomorrow afternoon…..